This collection spans two decades of cutting-edge thinking on globalization and crime. 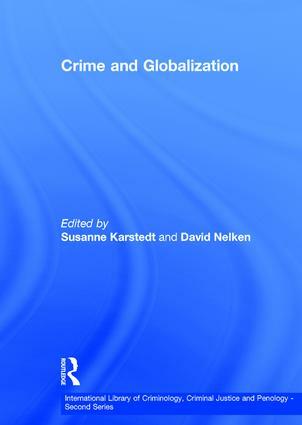 The selected articles confront criminological with interdisciplinary perspectives from sociology, political science and economics, and demonstrate how globalization has changed manifestations of crime and decisively re-shaped the criminological imagination as well as criminology’s theories, concepts and methodologies. The specially written introduction provides an innovative framework for insights into the manifestations of globalising crime, such as urban development in Mumbai, human rights talk of Brazilian gangs, gemstone mining in Madagascar, and the ’crimes of exclusion’ in the US and Darfur. This volume is ideal for both lecturers and students as it brings together influential foundational writings with in-depth studies from the best authors in the field and from all parts of the world. Susanne Karstedt is Professor at the School of Criminology and Criminal Justice, Griffith University, Australia. David Nelken is Distinguished Professor of Sociology at the University of Macerata, Italy, Distinguished Professor of Law, Cardiff University and Visiting Professor of Criminology in the Oxford Law Faculty, UK.